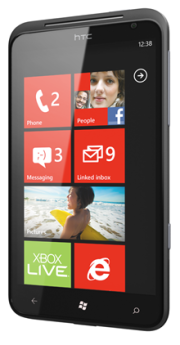 Microsoft showed off three Mango-powered Windows Phone 7 handsets that AT&T will be selling during the upcoming holiday season. The smartphones were announced by the wireless carrier last month, but the public couldn't touch and feel the phones until their debut at the All Things D Asia Conference in Hong Kong. HTC Titan, with a spacious 4.7-inch display and front and rear cameras housed in a brushed aluminum shell that's only 9mm thick. Samsung Focus S, with a 4.3-inch AMOLED display, front and rear cameras, a 1.4 GHz processor, super-thin profile and support for 4G speeds. Samsung Focus Flash, the economy model in the group, with a 3.7-inch AMOLED display and 1.4 GHz processor. Pricing and availability details haven't been released by AT&T. Microsoft blogger Ben Rudolph gushed that the phones are "simply beautiful," but truth be told, though, if you were shown photos of the phones side by side, you would be hard-pressed to tell them apart. The handsets do look attractive, although for style in a Windows Phone 7 model, I still believe LG leads the pack with its recently released Jil Sander designer handset. Unveiling of the AT&T handsets came on the same day that Microsoft announced it was "opening the spigot" on Mango, which it has been slowly rolling out since its release three weeks ago. "I told you we planned to balance quality with speed," Eric Hautala, Microsoft’s general manager for customer experience engineering, wrote in a company blog. "And for three weeks we’ve been watching quality while sending update notices to a growing fraction of phones." "It’s gone well," he continued. "So today we’re fully opening the spigot -- slightly ahead of schedule -- and making Mango available to nearly everyone in the current delivery pool." He added that owners of some Windows Phone 7 models would be receiving a firmware update next week to enable their phones to take advantage of some of Mango's features. His colleague Lees is expected to be a busy fellow in the weeks leading up to the holiday season. Lees will be the point man in Microsoft's campaign to win converts to the platform. Mango's release will make that job easier, although Lees still has to cope with the platform’s inability to support dual-core processors, something competitors Apple and Google have already adopted. More Mango fireworks can be expected next week when Nokia holds its Nokia World show in London. At the event, it's believed the Finnish handset maker will introduce its new line of mobiles based on the Microsoft operating system. Earlier this year, the ailing Nokia announced that it was putting all its eggs in the Windows Phone 7 basket as a strategy to reverse its declining fortunes.